Public good or private wealth | Universal health, education and other public services reduce the gap between rich and poor, and between women and men. 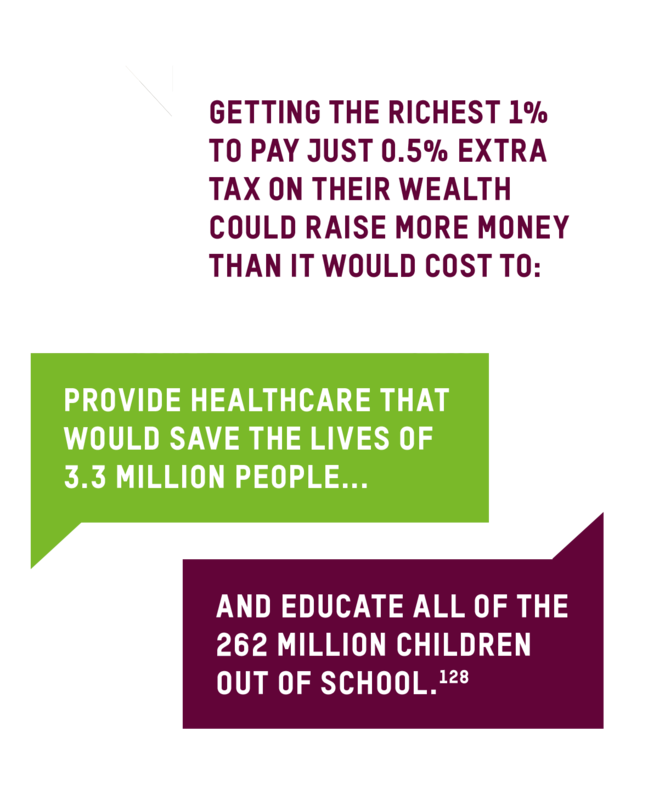 Fairer taxation of the wealthiest can help pay for them. The gap between rich and poor is pulling us apart. It stops us from beating poverty and achieving equality between women and men. Yet most of our political leaders are failing to reduce this dangerous divide. It does not have to be this way. Inequality is not inevitable – it is a political choice. Concrete steps can be taken to reduce it. This report focuses on the unparalleled power of universal public services like education and health in tackling poverty and reducing inequality. One of the great achievements in recent decades has been the huge reduction in the numbers of people living in extreme poverty, defined by the World Bank as $1.90 per person per day. Yet new evidence from the World Bank shows that the rate of poverty reduction has halved since 2013. It is 10 years since the financial crisis that shook our world and caused enormous suffering. In that time, the fortunes of the richest have risen dramatically. A private jet in the resort town of St Moritz, Switzerland. Photo: Pixabay. While the richest continue to enjoy booming fortunes, they are also enjoying some of the lowest levels of tax in decades – as are the corporations that they own. Respected voices have warned that across the world, from the US to Brazil, from Europe to the Philippines, inequality is contributing to a poisoning of our politics. In recent years, we have seen crackdowns on freedom of speech and democracy by governments worldwide. This economic divide both drives the gap between women and men and is driven by it. Economically unequal countries are countries where women and men are more unequal too. Rosalyn Martinez collects water from a water pump in the GMA Resettlement Area, North Tacloban, Philippines. The site was built to relocate families after Typhoon Haiyan, but many residents say they are in an even more vulnerable situation now and lack basic services such as reliable and clean water. Photo: Aurelie Marrier d'Unienville/Oxfam. The opportunity for every child to learn and to make the most of their talents is at the heart of a fairer society. Yet in country after country it is wealth, not talent, that dictates a child’s educational destiny. Gladys Asare Akosua, a teacher at Savelugu Girls Model School in northern Ghana, one of dozens of model schools in the north of the country. The model schools are funded and administered by the local authorities. Photo: Lotte Ærsøe/Oxfam IBIS. In most countries – both developed and developing – having money is a passport to better health and a longer life, while being poor all too often means more sickness and an earlier grave. 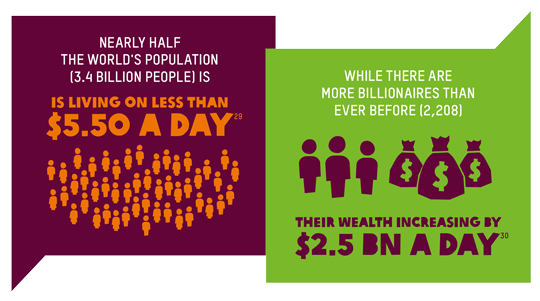 Inequality is not inevitable. There is no law of economics that says the richest should grow ever richer while people in poverty die for lack of medicine. The way services like health and education are delivered and the way in which pensions and other welfare payments are organized is critical to how much they reduce the gap between rich and poor. In many countries, public schools and clinics are often poorly staffed, underfunded and of very low quality. Dialysis treatment room, Bach Mai Hospital, Vietnam. Photo: Adam Patterson/Oxfam. It is time to focus on what works. To most effectively reduce the gap between rich and poor, public services need to be universal, free, public, accountable and to work for women. User fees for healthcare can be a life-or-death issue. Each year, many die or suffer unnecessarily because they cannot afford healthcare, and 100 million people are forced into extreme poverty by healthcare costs. To succeed, countries need to scale up the public delivery of services. When publicly delivered services are made to work, the scale and speed of their impact on poverty reduction cannot be matched. Governments should prioritize services that are most important for women, including those that reduce the burden of unpaid care work. To effectively fight economic inequality, public services need to be accountable and responsive to citizens. In many countries, Oxfam is working with allies to support citizens in demanding better and more accountable services. The richest people and the corporations they own are undertaxed in today’s world. The top rates of income tax, and rates of inheritance tax and corporate tax have fallen in many rich countries and remain low in most developing countries. The Port of Fontvieille, Monaco. Photo: Pixabay. In addition, governments have been reducing both the top rate of personal income tax and the rate of corporate income tax over the long term. As recently as 1980, the top rate of personal income tax in the US was 70%. Today it is almost half that, at 37%. Nurse Margaret Nyagwaya, left, takes care of a baby a few minutes after his birth at the maternity ward at Zvamabande hospital in the Shurugwi district of Zimbabwe. She says: 'Women like to come to the clinic and give birth here, they get extra vitamins to get stronger and we take good care of them.' The hospital was supported by partner NGOs during the Zimbabwe Joint Humanitarian Response to the 2015–2016 El Niño crisis. Photo: Ilvy Njiokiktjien/Oxfam Novib. This website is a summary of the report "Public Good or Private Wealth?" To read more and to access all source information, please download the report summary PDF. We’d love to know more about your interest in our report on inequality as it can help us to improve the work that we do. Please take 3 minutes to complete this short survey. Your data will remain anonymous and won't be shared with anyone else.